PLDT Inc. and its wireless arm Smart Communications, Inc. have kicked off the Road to Nationals, a nationwide multi-game grassroots tournament in search of the best eSports players in the country. Open to everyone, the Road to Nationals features regional competitions for DOTA 2 and NBA 2K19, as well as integrates the Mobile Legends Professional League Season 2 - three of the top PC, console, and mobile games in the world today. The top 8 teams for each game will advance to the grand finals at the eSports and Gaming Summit 2018, the country’s biggest gaming convention, at the SMX Convention Center on October 26 to 28, 2018. Over Php1.2 million worth of prizes are up for grabs for the winning teams and players, who will also get a chance to form part of the founding teams of The Nationals, the first eSports franchise league in the Philippines to be launched early next year. Interested teams and players may register for the Road to Nationals at www.thenationalsph.com. 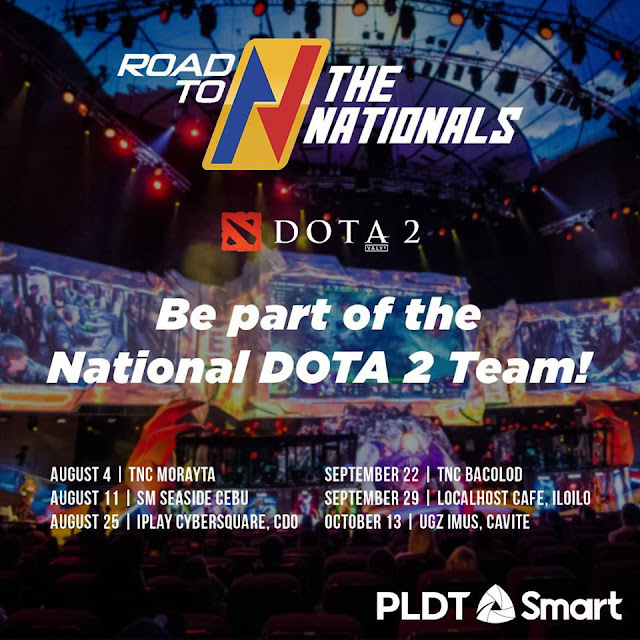 The Road to Nationals is set to host its DOTA 2 competitions in Manila (TNC Morayta on August 4); Cebu (SM Seaside Cebu on August 11); Cagayan de Oro (iPLAY Cybersquare on August 25); Bacolod (TNC Bacolod City on September 22); Iloilo (Localhost Café in Iloilo City on September 29); and Cavite (UGZ in Imus on October 13). The tournament will also hold its NBA 2K19 games in Cebu (First 5 Lounge in Cebu City on September 22); Davao (Game Patch in Davao City on September 29); Cagayan de Oro (Captain Poys Game House on September 30); Makati (Playbook on October 6 and 14); and Marikina (Secret Base Gaming Lounge and Boardgame Café on October 13). On the other hand, the Road to Nationals will soon announce the schedule of the Mobile Legends Professional League. Esports fans and gamers can catch the games on ESPN5 every Sunday at 10:30 p.m. starting August 12. PLDT and Smart are among the six corporate partners committed to the founding members of The Nationals, which include gaming industry mainstays TNC Pro Team, Happy Feet Esports, and BrenPro Inc, along with Cignal TV Inc, and STI Education Systems. The tournament is organized by Gariath Concepts. PLDT and Smart enable Filipinos to take their game play to the next level with the country’s fastest fixed and mobile networks, based on the latest Speedtest report of Ookla, the global leader in internet testing an analysis. With PLDT Home Fibr, the country’s No.1 home broadband, customers can enjoy lag-free gaming at home on exhilarating online multiplayer games like DOTA 2. On the other hand, powered by Smart LTE, customers can enjoy action-packed mobile games like Mobile Legends on their smartphones anytime and anywhere. Smart also offers GameTime 50, which gives mobile gamers 7 days’ worth of data specifically for playing top titles like Mobile Legends, Clash of Clans, Clash Royale, Arena of Valor, and Everwing for only Php50.